Here's our brand new video! Check it out! Our new video for I Wanna Take You To Paris is almost done. Can't wait to share it with all of you. FILTER Magazine's Culture Collide Festival in LA! We play it next weekend Friday October 5th & Sunday October 7th!! Also playing The Wombats, of Montreal, The Big Pink and many more....FULL schedule HERE. YES!! We are proud to announce that we'll be opening a series of shows for legendary new wave punks The B-52's in September!! Tonight in Las Vegas! We play with Zechs Marquise -- featuring the Rodriguez-Lopez brothers from The Mars Volta! That's right! Check out the show poster by Sonny Kay (Mars Volta artist)!! The Moog play the SXSW festival in Austin on Saturday March 17 at Treasure Island @ midnight. We'll also play other day events during the festival including Thursday March 15 at downtown Austin's Stephen F. Austin Hotel @ 5:00 pm. For more details, check our shows and Facebook pages. 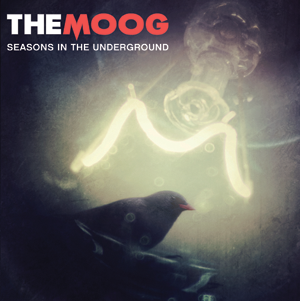 The Moog's new video "Seasons Change In The Underground" from upcoming "Seasons In The Underground" album is now available for viewing! This surrealist mini-movie was shot in Budapest and directed by two talented Directors: Tamás Gács and András Jeli. NEW VIDEO COMING NEXT WEEK! Next week we are premiering the new music video for the first single from new album! The clip for "Seasons Change In The Underground" will blow you away. So stay tuned! SOUNDCLOUD PREVIEW OF TRACK FROM NEW ALBUM! Although the April 2012 release date seems far away, we have teamed up with Hungarian website Recorder to give you a preview of the Ken Scott-produced album "Seasons In The Underground" with a full-song streaming of "RUN"! This track must be played loud for full enjoyment - so click here to check it out! FRESH NEWS ON THE NEW THE MOOG RECORD! We finally have NEWS on the third album's release, first single and video release schedule, etc! It's taken a little longer than we anticipated, but it's all finally coming together and we're happy to share some news with you. First of all, the title of the new album is "Seasons In The Underground"! The album's first single and video is "Run" -- a fast synth-heavy rocker, which will be released at the end of this year. The full album will be released in February in Hungary and in March in America, with other countries to follow. We also plan to tour the U.S. around the American release date and Europe later in Spring! MESSAGE FROM THE MOOG ABOUT NEW ALBUM! Hey everyone! We wanted to let you know that we are finishing the new material for our next album and it is almost ready and coming out great. This doesn't quite mean the new record is gonna be released right away, but at least the music part will be done very soon. We're more than happy about that, of course! Keep checking the page for more updates. Cheers! NEW SONG CLIPS AND STUDIO VIDEO FOOTAGE FROM KEN SCOTT! Legendary producer Ken Scott shot this short videoclip of us at London Bridge Studio in Seattle while we were recording the new album with him and the clip includes snippets of 6 NEW songs! Check it out on our YouTube page by clicking here! Join and Like our official Facebook page here! © Copyright 2012 The Moog. All Rights Reserved.